iPhone Blueprints is a new book by Scott Jensen that covers User Interface Design and its importance. In the book, Scott deals with everything needed to create an effective user interface. Most of the books that are available on the subject are typically full of design patterns with tons of theory and very little actual usable information. 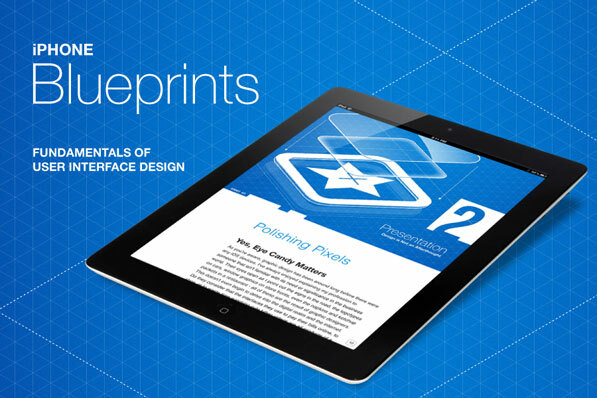 iPhone Blueprints [iBookstore link] is being featured here because it looks spectacular on the iPad and is one of the best guide books on UI design for the iPhone in existence today. The author currently works at Ender Labs that brought us the lovely music player app Track 8. Everything from the book cover to the chapter mastheads in this book is drool-worthy. The book is split up into 9 main sections. The introduction deals with why UI is important and the author then goes on to discuss who makes a good designer by drawing some brilliant examples. I love the emphasis on why UI and UX go together. The next chapter is about presentation. I cannot emphasize how good Scott’s choice of examples are here. He goes on to talk about how important the look of your app is and that as far as the customer is concerned, the UI is your app. The value of your app icon is very important and is an afterthought for most designers according to the author. He talks about how screenshots are like displays in a window for customers to browse as they walk by your store which has your icon as the store front. There are a number of tips for you throughout the book. This chapter features a case study on the app EventBoard and the complete process of designing the icon, screenshots and app website. Chapter 3 deals with traditional and experimental UI. National Parks by National Geographic and Rechner, the gesture based calculator are used as examples here. National Parks has an amazing view changing animation that I spoke about in my review and that is a perfect example of experimental UI done right. There’s an interview with the developer of Car Tunes which is highly based on an experimental UI. These case studies and interviews provide a really good insight into the design and development process. Understanding your users is the next topic here and is easily one of the most neglected topics when it comes to UI and UX. Most people design apps for themselves. While this may work in some cases, designers need to remember that they have spent a long time with an app and know how to get stuff done while a user may just delete an app if the experience was difficult or not good. The movie critic example here is spot on and when a critic starts finding plot holes in a movie, the entire experience gets ruined. In App Navigation is extremely important and there are so many apps I’ve used that just look good but make navigation between sections annoying. The author talks about the importance of consistency of what should be where in apps. The author’s own example of designing the app, Amusement Park is probably the most useful one in the book for UI designers because it deals with changing something for the better. Getting things done with as few taps as possible and minimalism is dealt with in the next chapter. There are many newer apps meant for power users. Tweetbot is a perfect example and Tapbots are the best at visually walking you through their app. They provide a nice helping hand to the user. Scott talks about the importance of help screens in your app and why some apps just don’t get it. Chapter 8 deals with updates and implementing new features in your app. He talks about how feedback is extremely important in app development and how you need to lower your defenses and not take things personally. People pay for your app and expect things. He provides us with a link to an interview with Kevin Systrom on how Instagram has evolved from a geo location check-in app. Listening to your users is very important and the case study provided here is of Track 8 that exploded with publicity and hence users wanting more and more from the app. The last chapter acts as a movitivational speech for designers and a quick recap of the book. iPhone Blueprints is an interactive iBook and the content is as good as the looks of the book on the Retina iPad. There has been an insane amount of effort put into this and if you use it correctly, it will be your bible. The book is pretty short at little over 100 pages but if you spend your time with the matter, possibilities are endless. It is an absolute joy to read in both portrait and landscape mode. iPhone Blueprints is available on the iBookstore for the iPad and is FREE for a week now selling at $1.99. Here are some screenshots from the book. Update II: The book is now back on the App Store again. Update: If you get a message saying “The item you’ve requested is not currently available…”, it’s because the book has been temporarily pulled by Apple and should be back again very soon. Bookmark the link and try again after some time.